One of the best aspects of my job as an education beat reporter was the ability to interview kids of all ages and backgrounds about subjects ranging from gummy bears to how what they were learning in the classroom could be applied to everyday life. In the eight years of that job, I would guess I interviewed hundreds if not thousands of students. I also wrote about services and programs designed to help kids live healthy, safe, happy and complete lives. I loved being able to write about events and programs happening in my community that were making a true difference in the lives of people who have so much hope and potential. demonstrating ways to get involved in community service that helps kids of all ages. As I went around to various booths and soaked in various parts of RazorFest, I couldn’t help but notice that they addressed the “whole child.” I’m not usually the “it takes a village” zen types but I do believe very adamantly that like adults, children of all ages must be seen as a whole person. What happens in one aspect of their life has an effect on everything else. For example, a child that doesn’t have enough healthy food to eat is not only hungry, he can’t concentrate at school (have you ever tried to work when your tummy growled?). A child who can’t concentrate will not perform as well in school. This easily leads to potential behavior problems as the child acts out the frustration and emotional problems can develop. Even children who seem to have it “all” need these kinds of events. 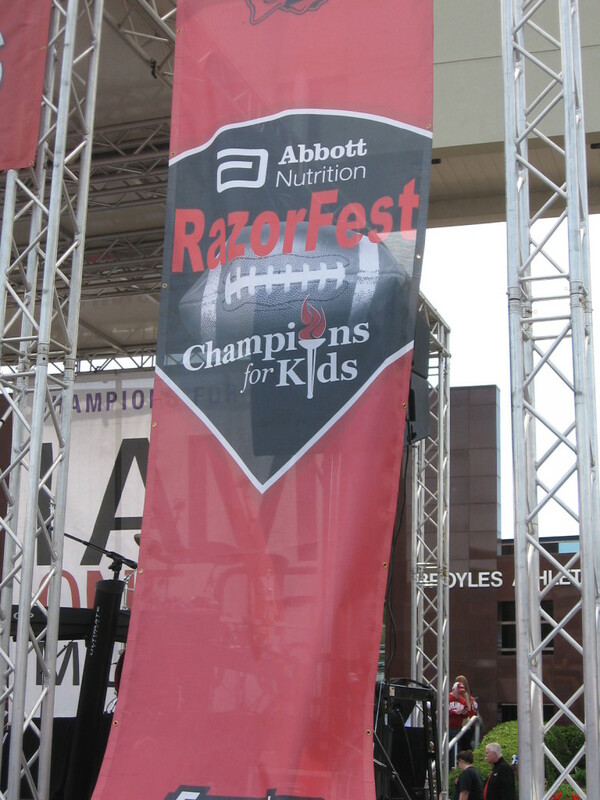 I was impressed that Razorfest addressed obvious issues like hunger, emotional health, physical activity and other basics, but the event also had information about ways that children can develop their talents and interests. There was everything from singing groups to information on gun safety for kids (hey, we live in the South y’all!). From a sports anchor from a sponsoring television station: It’s important for kids and families to be able to interact with people that they may see on TV to see that they are real people and that those people on TV want to be involved in their lives. It’s important for the TV people to spend time with people who welcome them into their homes to thank them and simply as people, be involved in the community in which they live. From a representative from a local non-profit: RazorFest gives non-profits the ability to share about what they do and “friend raise” instead of fundraise. They can educate people about their services so that the public can either partake in those services or volunteer to help others. Kids of varying ages performed live throughout the day. 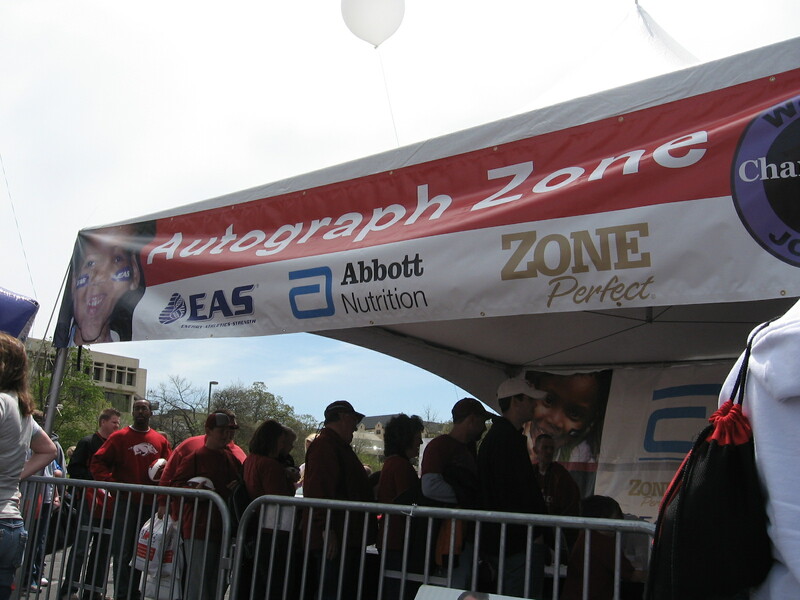 From kids of various ages (6-11): RazorFest is fun because it lets us play and meet cool people (like athletes and other famous people there for autographs). It shows us stuff that we can do that we didn’t really know was out there. 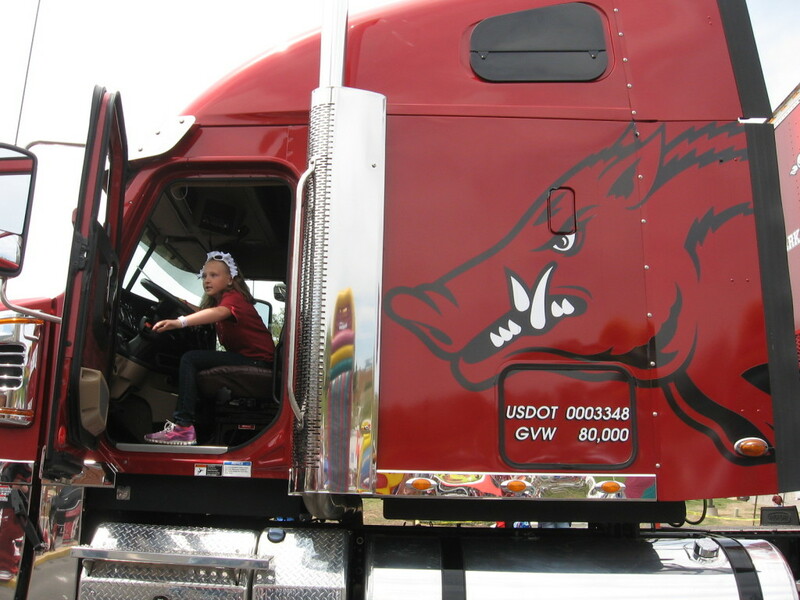 This girl (photo taken with her grownup’s permission) loved getting to climb in the Razorback semi-truck. 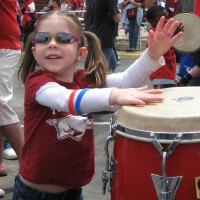 From several different parents: RazorFest lets us do something fun as a family and show our kids spending time with them is important. I especially appreciated comments from a mom with a daughter who has the same birth defect I do. She said that the event had activities that didn’t make her daughter feel “disabled.” In other words, they weren’t geared for special needs kids or otherwise designed to set her apart. They found a way to help the girl participate with the rest of the crowd with no embarrassing fuss. As I said earlier, this event was put on by Champions for Kids, which is a non-profit focused on meeting the escalating needs of children in our communities. Champions for Kids wants to make it SIMPLE for anyone to get involved so they’ve established SIMPLE Service Projects. Participants are asked to gather people in their community, choose a project, do the project and report back on how the project went. Easy peasy. Serious cuteness! 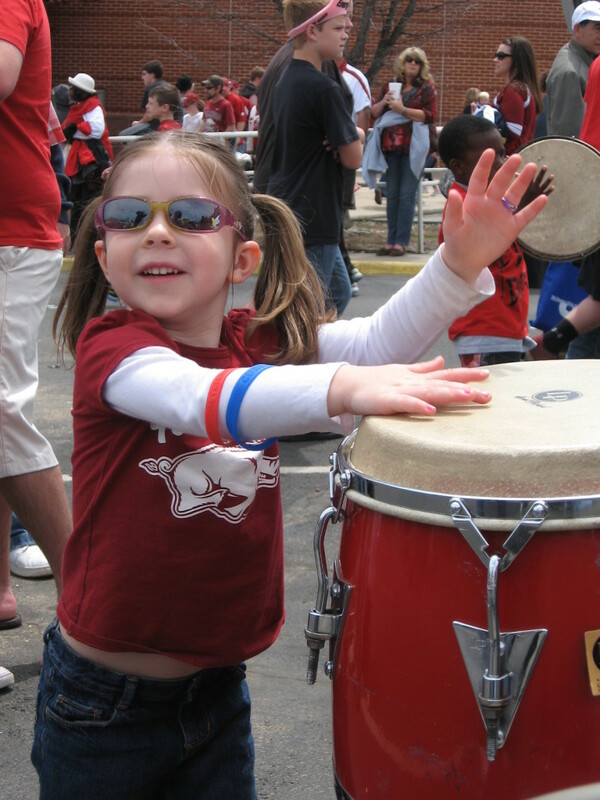 This little girl (photo taken with her grownup’s permission) loved banging on the drums at the Papa Rap booth. Like RazorFest, the SIMPLE Service Projects are categorized in a way that makes sure that all aspects of the child are being reached. There are projects that address safety, hunger, health, physical activity, and mental stimulation and learning. Potential projects include everything from gathering coupons for items children and families need to food drives or book drives. So what are you going to do to make a difference? Look at you with your headers and interview style! 🙂 Great post! HA! Thank you Laurie 🙂 I wish we could have seen each other that day. It was crowded but great fun. Good stuff, Jamie! Happy you had a good time! Thanks, Jasmine! It was crazy crowded but I still had fun. good job … lots of interesting info. It looks like you had a great time personally and professionally. I would say that from someone who is used to seeing a lot of black/gold from Shockerland, there was a whole lot of Razorback red going on there. HA! Yes dad, I live in Razorback land. It’s all Woo Pig Sooie down in these parts. I’m glad you enjoyed the blog! Jamie, what a great “reporter’s perspective” you have on the event! I was totally into it from the kiddos’ view. We stood in line forever to get faces painted, but that was #1 on their list. I was really tempted to get my face painted but since I don’t have kids I thought that might be weird, LOL. Thanks for stopping by and commenting! I appreciate your thoughts. Oh look! I wasn’t the only childless one there. It felt like I was! 🙂 Great post. HA! No you were not. Next year I might ask to borrow a five-year old just to see it through their eyes :)Thanks for coming by! It was! Sorry I just realized I never answered you. My bad. Thank you! 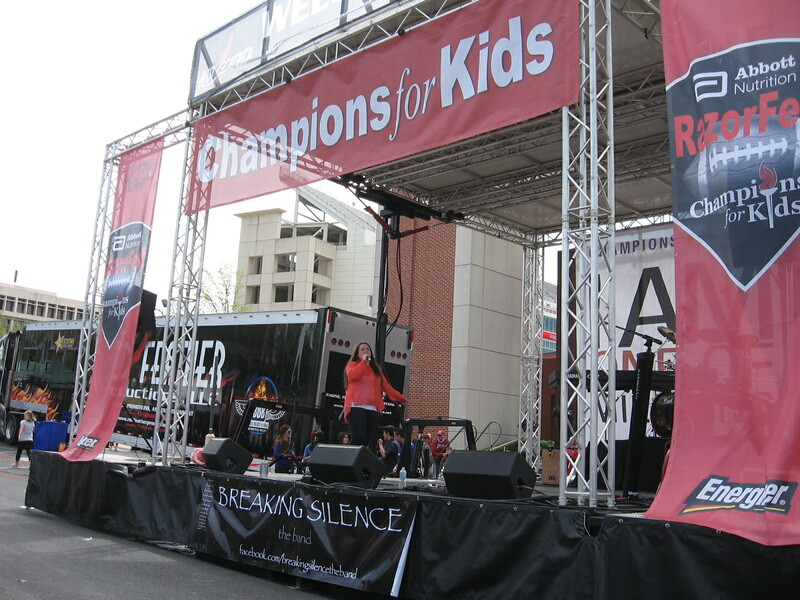 I am with champ for kids. 🙂 I am from New Jersey so I didnt get to go 🙁 BUT I am so glad I am getting to read some of the recap posts. I cant wait to stick around on your site and get to know you!! !